One of the goals I set for myself for this year was to start a monthly skincare diary. I initially thought of just creating a physical skincare diary, but I decided writing about it online would be better idea, as I could document and keep track my skin's progress more properly this way. 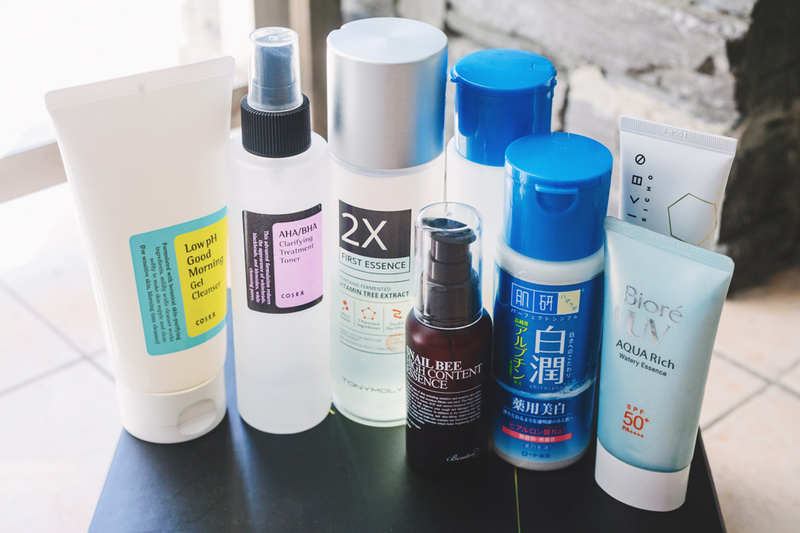 Also, a lot of people seem to be curious about Asian skincare, especially the Korean multi-step skincare routine, so I thought it would be a good idea to share my routine since it follows the same format. My skin is hella oily. I found out last year that my skin is dehydrated as well. I rarely drink water (I usually drink just 2 or 3 glasses a day.... bad, I know), so this contributes to my extreme oiliness. 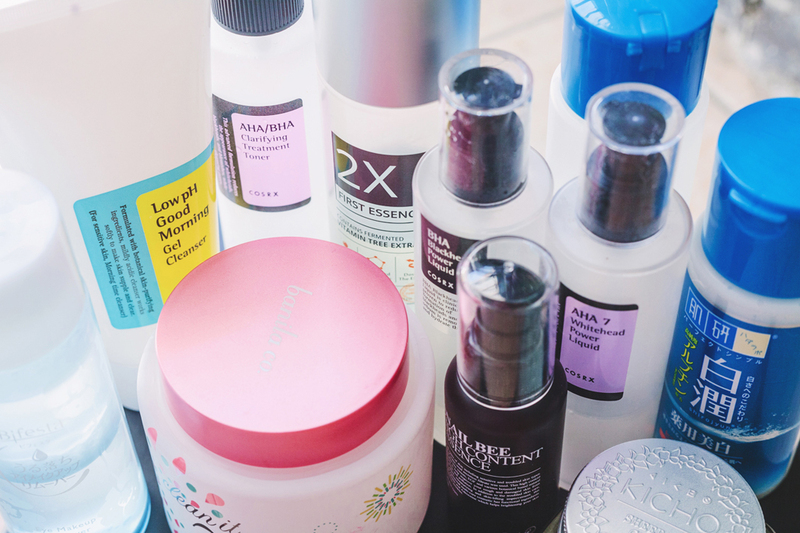 My skin isn't sensitive and can tolerate stuff like BHAs and AHAs well, but it doesn't do well with coconut-derived ingredients – Lauric Acid in particular. Ever since I entered my 20's my skin has become less prone to acne. But when I do get them, it's almost always the hormonal cystic kind, usually along my jawline. I'm prone to hyperpigmentation, and get marks really easily. I have fine lines starting to develop under my eyes, and around my mouth, but it's not a huge concern (for now). My face at the moment. I took this photo 20 minutes after I washed my face with just water. Except for the huge zit next to my nose and a handful of new red marks left over from a bout of acne, my skin is under control. I just need to work on hydration because some parts of my face are flaky. My main concern is post-inflammatory hyperpigmentation. 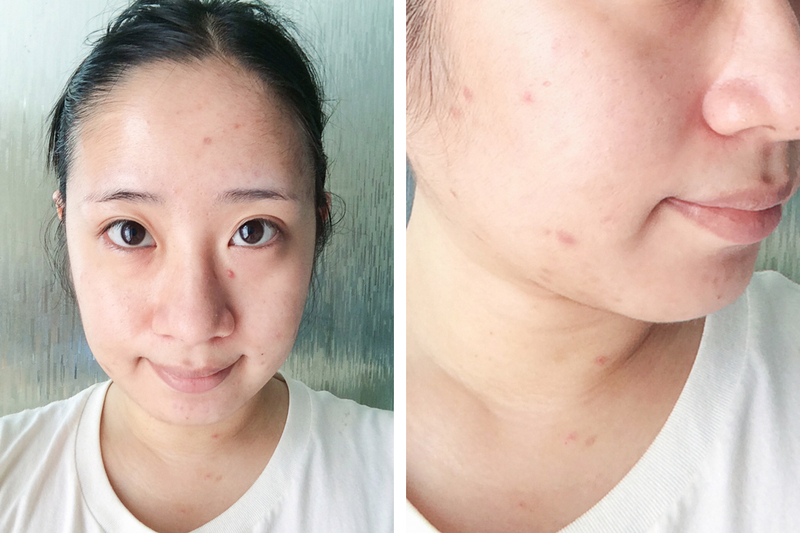 Without help from any products, my acne scars will take months or even years to fade. What's made it 100x worse is that I've been dealing with excoriation disorder or "skin picking disorder" ever since I was in high school. I've been doing it a lot less these days (by sheer willpower), but I still do it unconsciously at times. It's a huge problem because I get left with fresh red marks everytime. Though I have found that the things that have helped are 1) not looking at mirrors when I don't need to, and 2) having better skin overall (because I have less things to pick at), so I've been dealing with it better. The main goal is to get rid of my PIH completely, but I'd like to achieve an even skin tone and texture while I'm at it. My current skincare routine focuses on lightening PIH, adding hydration to my dehydrated skin, and strengthening my skin's moisture barrier. pH-balancing toner – COSRX AHA/BHA Clarifying Treatment Toner. Spray it on and pat into the skin. Even though my cleanser is at a low pH, my water isn't, so I need a balancing toner to prepare for acids. Some people suggest applying with a cotton pad to remove any residue, but the cotton pads that I use soak up too much product so I don't use that method. First essence – Tony Moly 2X First Essence. If you're wondering what a "first essence" is, it's a type of essence that's meant to go on first on your skin. These are usually more watery than most essences and are composed of very high concentrations of some kind of fermented ingredient. This one contains plant oil and fermented Vitamin Tree Fruit Extract for regenerating skin vitality. I notice that on days that I forget to do this step, my skin is just slightly less soft. Hydrating toner – Hada Labo Shirojyun Lotion. Since I have dehydrated skin, I need products with a lot of humectants like hyaluronic acid to keep moisture in. I use the Shirojyun and not the Gokujyun because it contains arbutin (for brightening). Essence – Benton Snail Bee High Content Essence. It absorbs super quickly, so it's great even for days I have to put makeup on. This product is HG for me – it speeds up the healing of any scars and lightening PIH. Moisturizer – Hada Labo Shirojyun Milk. If I'm doing the next step, I wait 5-10 minutes for it to absorb. Sunscreen – Biore Aqua Rich Watery Essence SPF50 PA++++. I only do this step if I have to go out. I very rarely go out, but I never go out without sunscreen. I use the Biore sunscreen for days I have to be out and about, because it has more UVA protection. Also, it dries super quickly, so I can move on to doing my makeup without waiting that long. For days I don't need to wear makeup and can go out with a hat, I use the Kicho Ultra Moisturizing Sun Cream*. Point makeup remover – Bifesta Eye Makeup Remover. In my experience, this is the only thing that can remove my waterproof eyeliner and lip tint completely. Since I only need a few swipes to remove my eye and lip makeup, I use what's left on the cotton pad to remove the rest of my face makeup. Oil-based cleanser – Banila Co Clean It Zero, my HG first cleanser. I use this to thoroughly remove left over makeup. Gentle, low pH cleanser – COSRX Low pH Good Morning Gel Cleanser. I know what you're thinking – doesn't that mean you'd be triple-cleansing?? 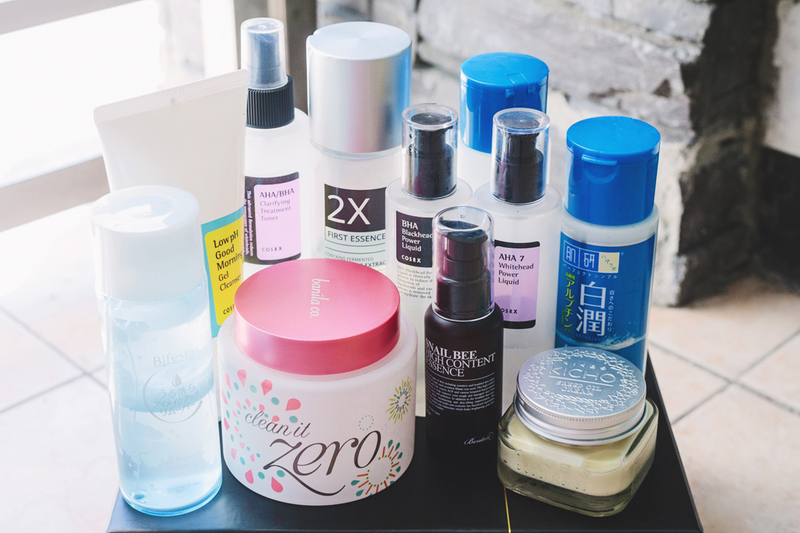 Makeup remover, an oil-based cleanser, and a foam cleanser all in one routine probably seems like overkill, but since I wear pretty heavy-duty makeup, I don't want to take any chances! I make sure to moisturize well afterwards, so there hasn't been a problem so far. pH-balancing toner – COSRX AHA/BHA Clarifying Treatment Toner. Vitamin C Serum – Rohto Melano CC Intensive Anti-Spot Essence. Apply, wait 20 mins. BHA – COSRX BHA Blackhead Power Liquid. Apply, wait 20 minutes. According to COSRX applying this with a cotton pad is the best method, but like I said, my cotton pads absorb way too much product, so I just use my fingers. AHA – COSRX AHA 7 Whitehead Power Liquid. Apply, wait 20 minutes. I find that my skin needs BHA more than it does AHA, so I've been using this just once a week instead of every other day like I did before. First essence – Tony Moly 2X First Essence. Hydrating toner – Hada Labo Shirojyun Lotion. Essence – Benton Snail Bee High Content Essence. Sheet mask. Once a week (usually on the same day I do an AHA), or more if I feel like it. Moisturizer – Hada Labo Shirojyun Milk. Occlusive – Kicho Sheep Oil Cream. As the last step of my evening routine, I use a sleeping pack or cream to lock all the layers of moisture in. My HG is Mizon's Good Night White Sleeping Mask, but right now I'm using Kicho's Sheep Oil Cream*, which I love just as much. And that's it. 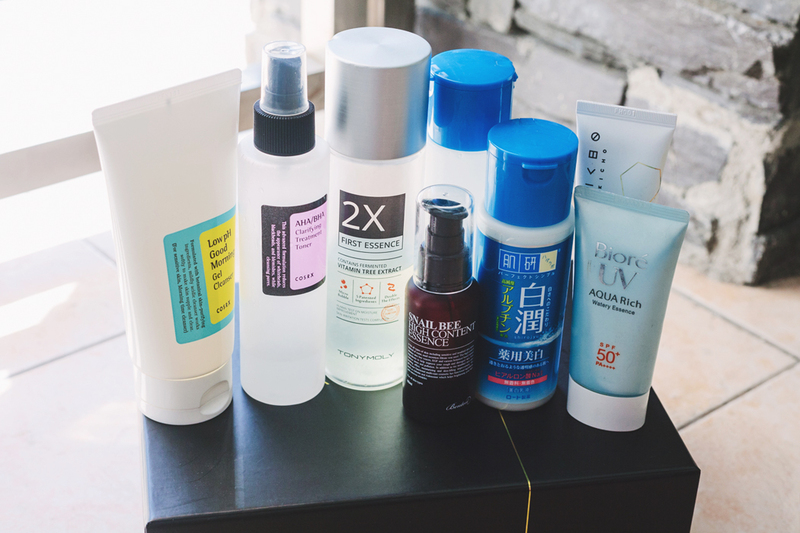 As this is the very first entry in my online skincare log, this month's entry was more of an introduction to my skin condition and the products I use. I'll do this again at the end of next month, hopefully my skin will have improved some more by then. For now, I need to focus on hydrating, since that's what my skin badly needs right now. By hydrating, I mean drinking more water—at least 2L each day. I've downloaded a tracker to somewhat help me with this. Wish me luck! DISCLAIMER: Items with an (*) were sent in for review. Opinions remain my own. Also, this post contains affiliate links. Clicking those links before you shop means that Chainyan.co receives a small commission, which helps to support the blog. Please see my full disclaimer for more information.